In the war between the Genji and Heike clans, the Genji won a series of battles and defeated the Heike. Sasaki Moritsuna, a warrior in league with the Genji, successfully crossed the channel on horseback to lead the vanguard in the Battle of Fujito in Kojima, Bizen Province (1184). Thanks to this outstanding accomplishment he received, as his reward, the domain of Kojima Island. On an auspicious spring day, he goes to survey his domain for the first time. Then, an old woman appears before Moritsuna and reproaches him for killing her son. Although at first he feigns ignorance, after being grilled repeatedly he feels pity for the old woman and finally confesses the truth. The Genji troops had taken up their position at Fujito, which was separated by the sea from the Heike camp, which prolonged the battle. Moritsuna therefore asked a young local fisherman where and when the sea bed would appear in the channel shallow enough so that horses could cross it when the tide ebbed. However, Moritsuna wanted neither the Heike nor his fellow Genji warriors to learn this information. Therefore, he killed the young fisherman and sank his body into the depths of the sea to prevent him from telling anyone else. Listening to his confession, the old woman nearly becomes deranged. She rolls on the ground, shouts that Moritsuna should kill her, too, and pressures him to give her son back. 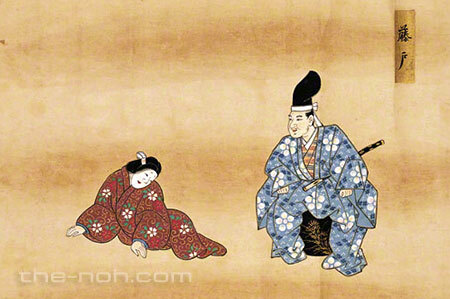 Moritsuna comforts the woman, promises her that he will console the soul of her son, and lets her go home. At the Fujito shore, Moritsuna hosts a memorial ceremony with music and recites the Heart Sutra in order to console the soul of the fisherman. Then the fisherman's ghost appears on the sea. The ghost tells him that he has appeared because he bears a grudge for having been savagely murdered. The ghost describes the tragic scene of being stabbed by a sword, and his body being dumped into the ocean. The ghost then says that he was about to transform himself into an evil dragon and take revenges for his grudge, but that now he appreciates that a Buddhist commemoration ceremony is being held specially for his sake. Now the fisherman’s ghost is able to reach the world of the dead and attain buddhahood. Is all fair in war? This masterpiece describes the tragedy of a common fisherman who was killed for the sake of a warrior’s military success and the profound love of his bereaved mother. In every era, war inevitably embroils civilians in many tragedies, whether they agree or disagree with the war effort. 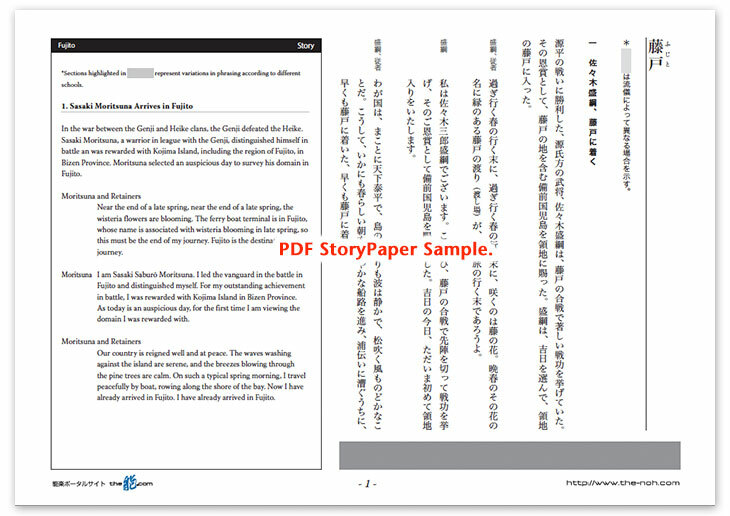 Through a tragic legend, “Fujito” describes the injustice and the sacrifice of innocents that are obscured by outstanding military victories. Today, we still see, in our daily lives, grieving mothers who have lost their children. The tragedy of the fisherman and his mother is staged not as a historic incident from ancient times, but as an event happening in this very moment, which makes a strong, unforgettable impression upon the audience. At the end of the play, the ghost of the fisherman attains instantaneous buddhahood. Considering the tremendous power wielded by those with authority in olden times, the fisherman’s somewhat odd attitude of quickly forgetting about his grudge might be hinting at the bitter disappointment that he could not express openly. On the other hand, the immediate enlightenment of the deceased confers great salvation upon the bereaved. This profound Noh drama can be observed from different perspectives and invoke a wide range of sentiments. What will this drama make you feel?